When a baby is born the skull bone is really a collection of many smaller bones which abut one another at sites known as sutures. The most noticeable is the anterior fontanel or “soft spot” where four bones meet. As the brain grows, the sutures allow for rapid expansion in a symmetrical fashion. It is the brain that essentially determines the head size and shape under normal circumstances. If for any reason one or more sutures closes to early the brain is forced to grow in a different direction where the bones are not resisting growth. This is like blowing up a balloon but pinching it as it inflates. The air goes in but the balloon inflates in the direction away from where you are pinching it. Some of these conditions are so obvious that a physician can make the diagnosis by just examining the baby. In other cases a radiographic study may be needed. Probably the most popular study is a 3 dimensional CT scan, though clearly certain conditions may be proven with a simple set of skull x-rays. Unfortunately sometimes no single radiological test is adequate to make a clear diagnosis. In these cases it may be best to wait a few weeks to months to see if the condition is going to progress. What has probably become the hottest topic from a practical standpoint is the infant who develops a flatness on the back side of the head. Several years ago researchers determined that SIDS (sudden infant death syndrome) may be linked to babies sleeping face down. The recommendation has been for babies to thus sleep on their sides or backs. With this has come a great increase in the number of infants with flat heads. Often there is an associated bulging of the forehead and a displacement of the ear on the same side of the flattening. The great majority of these children do not have a synostosis but rather a condition known as positional molding or “lazy lambdoid” . The lambdoid is the involved suture. The majority of these children should improve without surgery utilizing either repositioning techniques or a specially molded helmet. Rarely surgery may be needed for advanced cases. Parents often ask what the necessity of the operation is if the child is doing well. The answer is somewhat confusing. At certain times, if you do not treat the synostosis, then pressure can build up in the head and cause injury to the brain. As best as can be known this is probably true in the minority of cases. What is true is that most of these conditions will cause a marked deformity to the skull and face that the child will have to live with for his entire life. These two reasons are usually felt sufficient to justify the risks of surgery. 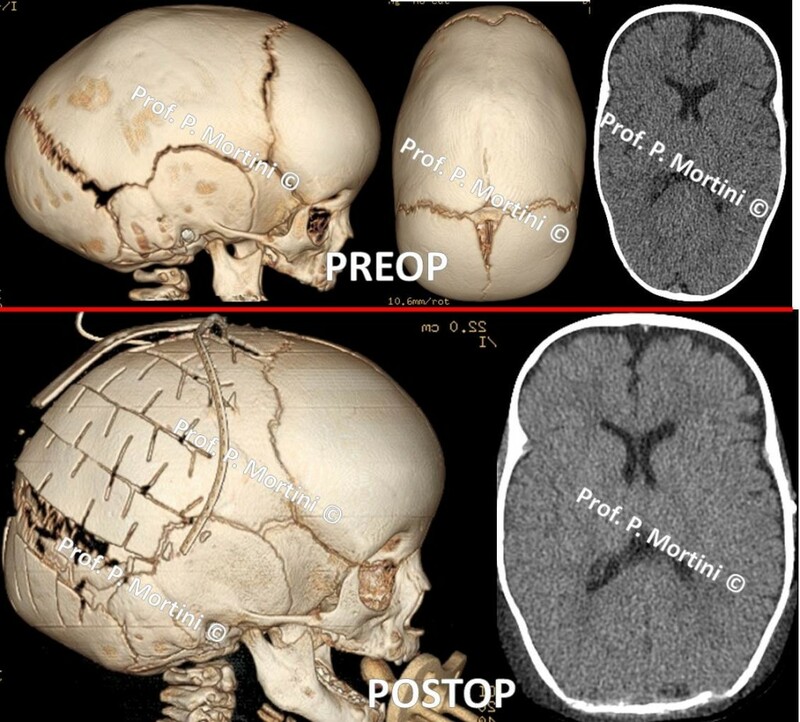 Most operations require rather extensive removal, recontouring and finally replacement of the skull. Often this is associated with blood loss sufficient to require a transfusion. Fortunately these operations are elective and blood donation can be performed. Many different techniques are available to the surgeon to replace the bone securely at the end of the operation. In addition to surgical sutures and wires, very fine plates and screws can be used. These materials are essentially too small to be felt under the skin. In experienced hands, the results of surgery are usually excellent and only rarely would further surgery be required. In resent years we have begun to offer minimally invasive procedures, operating through one inch incisions. In some cases the same bone removal is performed, in others a more limited removal of the fused suture is removed and then the child is placed in a special helmet to aid in the reconturing at the skull for the first year of life. These minimally invasive procedure are generally done at a young age, often in the first few months of life.